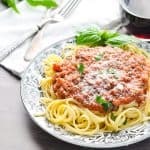 This Quick and Easy Spaghetti Bolognese Sauce is a simple, shortcut version of the classic comfort food! Heat butter in a large pot over medium-high heat. Add the onion, carrots, celery, and beef. Crumble the beef with a wooden spoon and cook for 5-7 minutes, or until meat is no longer pink and vegetables are tender. Stir in the garlic, oregano and red pepper flakes and cook for 1 more minute. Add red wine to the pot and stir, scraping up any brown bits on the bottom of the pan. Add tomatoes, tomato paste, 2 teaspoons of salt, and ½ teaspoon pepper. Stir to combine. Bring to a boil, reduce the heat to low, and allow the sauce to simmer (uncovered) for about 10 minutes. While the sauce simmers, cook the pasta according to package instructions. As the pasta is cooking, stir the basil leaves and cream into the sauce. Simmer for about 5-10 minutes, stirring regularly. Keep it on very low heat and do not boil. Add Parmesan cheese and stir to combine. Season with additional salt and pepper, to taste. Serve sauce with pasta, and garnish with additional Parmesan and basil, as desired. Note: You can freeze any leftover sauce in an airtight container for up to 3 months. For a Light, Low-Carb Option: Serve the Bolognese Sauce over zucchini noodles!